It’s the most wonderful time of the year…it’s almost fall y’all! I am so loving this fall weather that we have going on in the south! It has been gor-geous! One of the things that I get most excited about when fall draws near is all things pumpkin…pumpkin cheesecake, pumpkin pies, pumpkin muffins, pumpkin spice lattes…need I go on??? Praise the lawd for big sweaters! Ha! 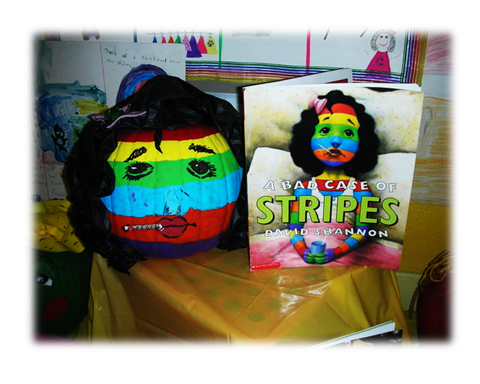 Yes…we turned pumpkins into our favorite book characters and wrote book reports on our “treats” to match! You can check out more of our pumpkins HERE or HERE! They are so darn cute…even if I do say so myself! This has been a class fave every year! My kids talk about them FOR-E-VER! As most of you know, I have followed my kiddos from 1st to 3rd. This means that we have put together pumpkin book reports for the last two years! This year, I have decided to switch things up a bit! We will be writing biographies about some of our favorite American Heroes and will create pumpkins to match! Trick or Treat Biography Reports and Pumpkin Projects will be the highlight of all fall activities in your classroom. Everything you need to get this project up and running is included in this unit. I have created the initial parent letter and poem that will get your parents enthused about their part at home. Then I have created four biography report formats: K-1 Color Copies, K-1 Black and White Copies, 2-6 Color Copies and 2-6 Black and White Copies. Each biography section contains a parent letter, direction sheet, rubric, and fact treat cards. 2-6 has an additional first draft section since their report requires writing. Or if you prefer the unit book report style, click on any of the pictures below! You can read more about this unit HERE! How cute is Annie?!? Ha! Night y’all! Oh my goodness are those not the cutest little pumpkins ever! The kids must love this! I love this! At our school we do a week long celebration for Dr. Seuss (as many others do too). One of the days is usually book character day. It was fun, but kids would always wear random costumes and not many participated. Last year, I saw this pumpkin and was inspired to do the same. Unfortunately pumpkins are not in season in March....so we used potatoes. Same idea different vegetable. They were a hit and far more kids participated. Love this packet! You are AMAZING! I can't wait to see what your kids come up with this year! This idea is amazing! Absolutely adorable! This looks like a super engaging activity! Do you assign this as a make at home project or do the students do this project in class? Do you have your kids do this at home or do you have all the supplies for them to make them in class?